Stories of courage and perseverance of Lumad students and teachers poured out at the gathering. MANILA – Advocates for the rights of children and indigenous peoples vowed to strengthen their unity for education and people’s rights in the face of growing repression and threats of martial law declaration nationwide. 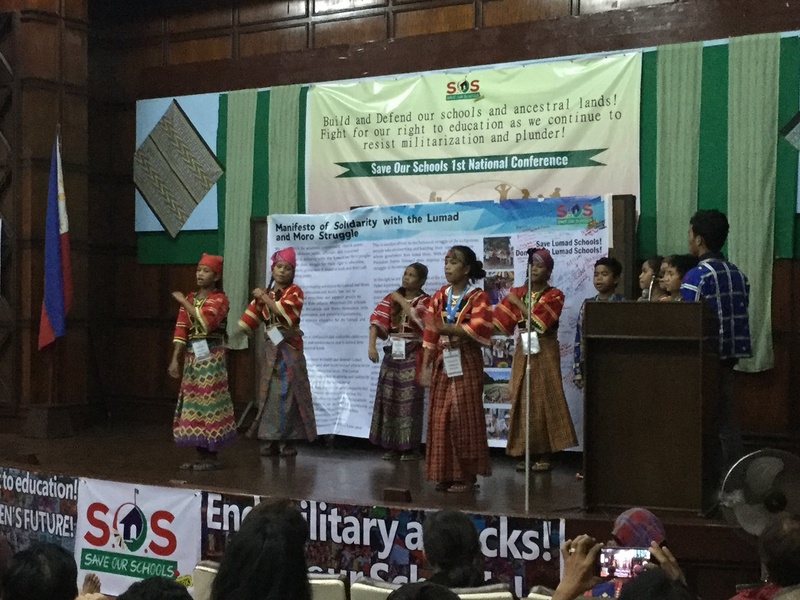 The Save Our Schools Network (SOS Network) declared its first national conference on Saturday, Sept. 16 a success, despite the harassment against the participants coming all the way from Mindanao. Davao City police barred at least 32 conference delegates who were travelling to Manila from the Davao International Airport despite having necessary permits to travel for the Lumad children. Most of the delegates were students from the two Lumad schools Salugpungan Ta Tanu Igkanuon Community Learning Center (STTICLC) in Talaingod, Davao del Norte, and the Mindanao Interfaith Services Foundation, Inc (MISFI) in North Cotabato. Later the same day, the delegates were allowed to board their flight and they arrived in the middle of the conference being held at the University of the Philippines in Diliman, Quezon City. The SOS Network condemned the incident, which jibes with threats of martial law declaration by President Duterte. 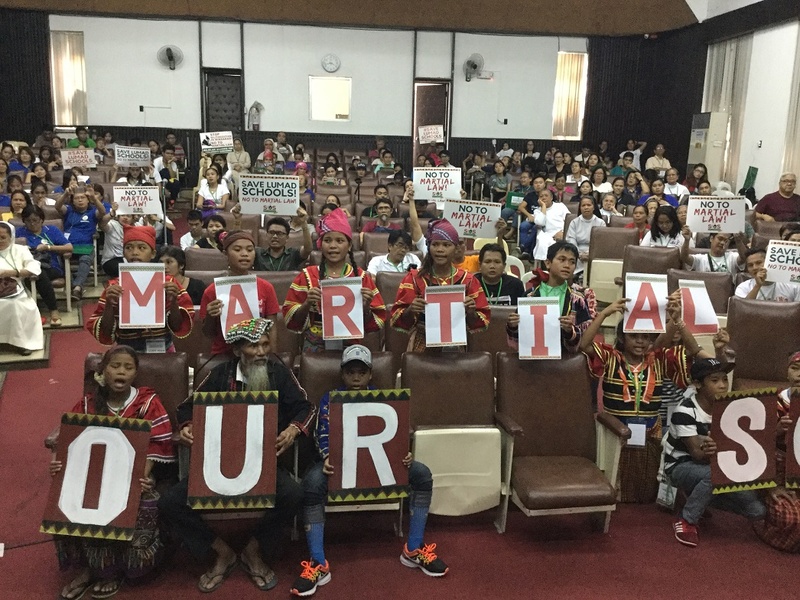 Despite the intensifying harassment against Lumad children, their parents and advocates, the atmosphere in the conference was dominated by a firm commitment by the Lumad and their supporters to fight for their rights to their ancestral lands and self-determination, and the right to education of national minority children. The conference came out with a manifesto of solidarity with the Lumad and Moro struggle. “We are one with the call of the Lumad people to end Oplan Kapayapaan and President Duterte’s all-out war against the indigenous peoples and to resist martial law in Mindanao. As peace-loving advocates, we are united to resist and fight threats of a nationwide martial law implementation that will lead to multiple rights violations,” the manifesto read. The alternative schools built in Mindanao were brought about by the state’s inability to reach remote communities and extend social services, like education. Based on the SOS Network data, nine out of 10 Lumad children have no access to education. With the help of people’s organizations and non-government organizations, there are now more than 200 alternative schools in four regions in Mindanao: the Alternative Learning Center for Agricultural and Livelihood Development (Alcadev) and Tribal Filipino Program of Surigao Sur ( TRIFPSS) in the Caraga region, the Rural Missionaries of the Philippines-Northern Mindanao Region’s Literacy and Numeracy Schools for Indigenous Children, Center for Lumad Advocacy and Services, Inc. (Clans) in Soccsksargen and STTICLC, Mindanao Interfaith Services Foundation, Inc. Academy in Southern Mindanao region. Testimonies from teachers in schools showed how the Lumad had improved their lives after their schools were put up. The Alcadev for one, has a curriculum that focuses on agriculture. Volunteer teacher Kenneth Cadiang said, just recently, they harvested a thousand kilos of vegetables which can cover not only their supply of food, but can also be sold at the market. The same abundance was seen in the communities where the RMP-NMR extend their services, where families also harvested upland rice, Michael Sumbian of the RMP-NMR said. The RMP-NMR students were also able to pass junior high school exam and are now junior high school students in a national high school, said Sumbian. Gem Alonzo of Clans said their student, aged 63, in the adult numeracy program got hold of a pencil for the first time when their alternative school was built in their community in Sarangani. “He is eager to learn,” she said. Junance Fritzi Magbanua of Misfi shared that their limited resources was never a hindrance. She said their schools started using leaves as paper and charcoal as pencils. Magbanua said they now operate 79 complete primary schools, 46 complete elementary schools, 18 secondary schools and two tertiary schools. The schools have been the target of attacks perpetrated by state security forces. As these schools are located in ancestral lands where resources are rich, the investors of corporations, local and foreign, are driving them away from their lands to exploit their resources for their own profit. “The Mamanwa tribes are being evicted from their ancestral lands because of plantations,” said Cadiang. Despite securing necessary permits to operate from the local Department of Education, attacks against these schools persist. Under Duterte, SOS Network said, there have been 89 cases of military attacks against these schools from July 2016 to July 18 this year. At least 39 schools were forcibly closed affecting 2,624 students. Teachers are also not spared, Alonzo said seven of their teachers were charged with trumped-up cases such as frustrated murder. “Teaching is important, no one should be imprisoned for doing so. Despite the teachers’ efforts to teach the marginalized, this is what the government does,” said Alonzo adding that the government does not want the Lumad to be literate so they could continue exploiting them. “We will not be discouraged. We will fight (alongside with the Lumad,” said Alonzo who is a volunteer teacher. Magbanua reported during the conference that earlier that day, at 5:00 a.m. about 20 armed men in full battle gear raided their office in Indangan, Buhangin, Davao Del Sur. She said harassments, the killing of their students, teachers, administrator and vilification against them serves as their motivation to work hard and build more schools for the Lumad people. She said they have campaigned, lobbied and had a dialogue with DepEd Secretary Leonor Briones about their plight but their calls and demands fall on deaf ears. Even then more and more Lumad communities are clamoring for the establishment of Lumad schools. She said they now have 131 schools in the SMR alone. They were also able to form the Association of Community Educators (ACE)-Mindanao and Liga ng mga Iskolar ng Bayan (LIB). “That is why role of support groups are essential so we could build more schools in the countryside,” she said. 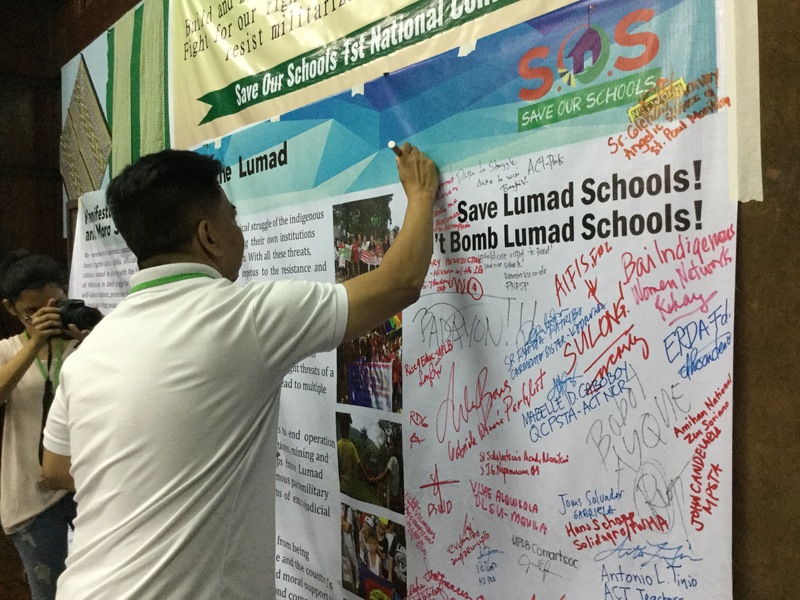 The Save Our Schools campaign was first initiated in Mindanao in 2012 due to massive attacks on Lumad schools. The campaign went national in 2014 and now has been gathering support from different organizations, individuals, child rights advocates, personalities and academicians. On the first national conference, supporters who came to the event signified their support, through cash donations, school supplies and various other forms. Department of Social Welfare and Development Assistant Secretary for Promotive Programs Malou Turalde and Undersecretary for Institutional Development Mae Fe Templa also came to the event and pledged to stand with the Lumad children in their fight for their right to education. 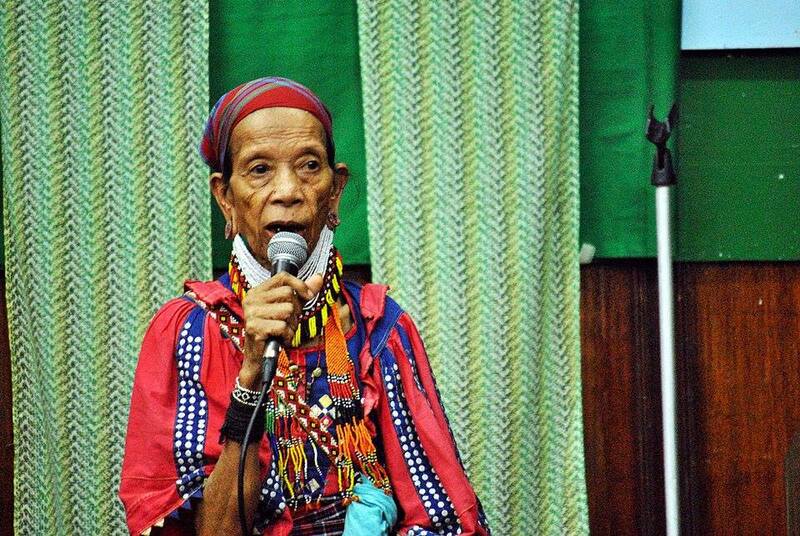 Bai Bibyaon Ligkayan Bigkay, meanwhile, expressed her deepest gratitude to the supporters of Lumad community in their struggle for self-determination and right to education. She said when she was younger, she did not see any help from the government for her as well as Lumad children’s education. “Education was attained by our children through the help of organization and the church. Now that I am old, I have seen the help that I have been seeking, and it is the children who now benefit,” she said through an interpreter. “You are our only hope so that children can continue with their schooling. We can no longer rely on our government, they are the ones who are killing our students,” she said.